You Are Here: Home » What is Deep-Seabed Mining? Deep seabed mining is the extension of terrestrial and shallow-water mining activities in the deep ocean in the quest for minerals. It requires new technologies and approaches and new scientific knowledge, most of which have yet to be acquired and developed. Learn more about the deep-sea here. There is widespread concern about the impact deep seabed mining will have on the ecosystems and habitats of the deep and how the practice can be managed. The practice is at an early stage – highly speculative and experimental. Consequently, the nature of the adverse impacts on deep-sea ecosystems remains unknown. But existing information has led scientists to warn that biodiversity loss would be inevitable and likely irreversible if deep seabed mining was permitted to occur, the activity could directly impact tens of thousands of square kilometers of seabed in deep abyssal plain areas and potentially release both toxic chemicals and vast sediment plumes. The pace of development is breathtaking. A new breed of specialized mining firm is poised to dive deep in its quest for rich sources of minerals, including metals and rare earth elements (REEs) for the high tech and renewable energy industries. It is vital that this quest for wealth is tempered by a strong set of mechanisms and controls which protect the marine environment and its biodiversity, ensure that extreme caution is taken, and allow the fair allocation of gains from the global commons for both current and future generations. Potential for mineral wealth in the deep ocean was identified as early as the 1960s. However, attempts to mine have been unsuccessful so far as the reserves have proved too expensive to get to and difficult to mine. It is only very recently, as technological advancement has been matched by escalating commodity prices and demand, that the highly speculative practice has begun to be considered economically viable by some companies. Since the turn of the century, several factors have converged to propel deep seabed mining from a much-discussed concept towards becoming a practical reality. A major impetus for exploiting minerals in the deep sea has been increasing global demand for copper, cobalt, nickel, silver, manganese and rare earth and specialty metals. This is partly being driven by the growth of renewable energy technologies. A number of these metals are used in rechargeable batteries, solar photovoltaic generators and wind power plants. Correlated with these market factors is a growing push in many countries to ensure a secure supply of such raw materials in the longer term. On the supply side, huge technological advances – especially in the offshore oil and gas industries, which have been moving into ever deeper waters – have meant that many of the technical challenges posed by mineral extraction in the deep sea can now be overcome. This combination of perceived economic viability and technological feasibility has spurred a surge in interest displayed by both countries and private companies in exploring the deep ocean for mineral resources with the view toward developing a commercial deep seabed mining industry. There are currently three types of mineral of interest to prospectors in the deep ocean. 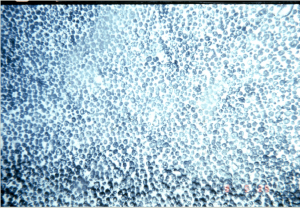 Manganese nodules are mineral precipitates of manganese and iron oxides. They occur over extensive areas of abyssal plains at depths of 4,000–6,500 meters and grow extremely slowly – 2 or 3cm every million years. Nodules contain nickel, copper, cobalt, and manganese, as well as traces of other metals (notably REEs) that are important to high-tech industries. Various forms of mineral extraction are being considered for full-scale operations but many are variants on the hydraulic suction system. Hydraulic suction mining vacuums up the nodules for transfer to the mining vessel and then a second pipe may return wastewater and tailings (usually fine particles) to the seabed or for release at some depth in the water column. The nodules provide a substrate for a variety of suspension feeders and creatures that live on or just below the surface and which are wholly dependent on nodules for their survival. These sediment communities are known to differ greatly between areas and have extremely slow restoration rates. In common with most deep-sea life forms, little is known about how much space these colonies and species need to survive. However, scientists are increasingly recognizing that the diversity of species and ecosystems in deep abyssal plain areas are far higher than was previously thought. 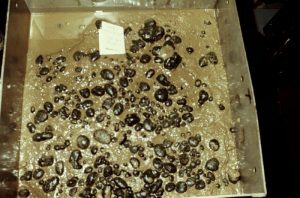 Mining manganese nodules will occur over large areas – a typical 30-year nodule mining operation would directly impact an area of approximately 10,000 square kilometers. It is likely that many if not most of the organisms living on or in the seafloor would be destroyed. Moreover, sediment plumes generated by the mining activity would likely cause adverse impacts to surrounding as deep abyssal plain species and ecosystems are poorly adapted to cope with this type of disturbance. Experiments carried out in the Peru basin and the Clarion Clipperton Zone in the Eastern Pacific found that even 30 years after relatively small disturbances of the seabed very little recovery of species in the disturbed areas has occurred.Under current mining scenarios, this process represents a major environmental impact. Cobalt precipitates onto rock surfaces in the deep ocean that are free of sediment (mainly seamounts). Layers build at such a slow rate that it takes one million years for a crust to grow between 1 and 5mm, less than the thickness of an iPhone. This is one of the slowest natural processes on Earth. Crusts of economic interest occur at depths of 800–2,500 meters on seamounts, mainly in the Pacific Ocean. Technologically, the mining of cobalt crusts is more complex than mining manganese nodules. Cobalt-rich crust mining involves the removal of the top layer of crust on the flanks and summit of a seamount to a depth of 5–8cm (or 10–16 million years’ worth of growth). These areas are often characterized by dense assemblages of deep-water corals, sponges, and other species which grow on the heart substrate that seamounts provide to these animals in the deep sea and they, in turn, provide the habitat for a large and highly diverse range of deep-sea species. As yet there is no lead technology for cobalt-rich crust mining but one method under consideration involves an enormous bottom crawling vehicle, attached to a surface vessel, which uses articulated cutters to fragment the crusts. Others envisage water-jet stripping, chemical leaching or sonic separation of crusts from rock. In addition to the massive destruction involved in removing the top crust, sediment plumes are likely to impact on suspension feeders such as sponges and corals beyond the impact site. Many seamounts are larger than mountains on land, with some dwarfing Mount Everest. They obstruct current flow, which results in strong eddies and upwelling, increasing primary biological productivity. The seamounts are biodiversity hotspots in the ocean, supporting complex ecosystems from their surface to their base. They are also known to be a stopping point for migratory species, which may use them as the equivalent of a motorway rest station. Any disturbance to such a finely balanced and slow-growing ecosystem is of concern. Many seamount ecosystems have already been damaged by bottom trawling and thus have lower resilience and need to be protected from further damage. Deep-sea hydrothermal vents – now thought to be the cradle for life on Earth – are found along mid-ocean ridges where new oceanic crust is created where tectonic plates move apart, and back-arc basins. They support some of the rarest and most unique ecological communities known to science. Sometimes called “black-smoker complexes”, the vents also form ore deposits with relatively high concentrations of precious metals – gold, silver, and copper, as well as zinc and other metals which precipitate out of the hot water spewing from the Earth’s crust. In total, around 7.5% of the global mid-ocean ridge – some 6,000km (250 times longer than Manhattan) – is now being explored for its mineral wealth. This is the geological backbone of the ocean. Organisms at vent sites do not derive their energy from light but from sulphide chemicals in hot (350OC) mineralized vent fluids. They are unlike any other life form on the planet. Most species discovered at vents are endemic to these areas and can exist nowhere else, and the vents support communities with extremely high biomass relative to other deep-sea habitats. The first commercial operator to explore for polymetallic sulphide deposits is Nautilus Minerals, which has commenced exploration in the exclusive economic zones (an area surrounding coastal nations, stretching out 200 nautical miles or 370 kilometers) of Papua New Guinea, Fiji and Tonga (covering an area roughly the size of the UK). This has been negotiated outside the auspices of the International Seabed Authority (ISA), directly with the national government of each country. For this work, Nautilus has developed a huge robotic machine called the “bulk cutter”, which weighs 310 tons (the equivalent of over 40 London buses) and is roughly as large as a medium-sized house. Although mining systems are still in development, they seem likely to be based around continuous-recovery systems using rotating cutter heads. Mining of hydrothermal vents would destroy extensive areas of vent habitat, including thousands of vent chimneys, killing virtually all the attached organisms. While more sea life is known to be attached to active hydrothermal vents, even the destruction of inactive hydrothermal vents will entail widespread habitat removal and destruction of species. The extent of the impacts to vents and other seafloor habitats mined will inevitably be severe at the site. Mining is also expected to alter venting frequency and create sediment and chemical plumes, potentially affecting ecological communities beyond the mined site. Life forms destroyed may well be endemic, meaning that mining may destroy species before they are even identified. The biodiversity of these unique, rare, fragile and geographically fragmented ecosystems, is of interest to science, is a potential source of new life-saving medicines, and may hold many secrets about evolution and adaptation of life on Earth and elsewhere in our solar system. For these reasons, prominent deep-sea biologists, conservationists, geologist, and others have called for a prohibition on mining on active hydrothermal vents. The International Seabed Authority (ISA) is the global body established under the UN Convention on the Law of the Sea (UNCLOS) to regulate seabed mining in the international areas of the world’s oceans. Its membership consists of 167 countries and the European Union. It is currently in the process of developing regulations that would permit commercial mining in the area. Companies and countries interested in opening up the deep sea to mining are pushing the ISA to complete the regulations so that they can begin applying for commercial mining licenses and claim areas. Globally the ISA has issued 29 exploration contracts for polymetallic nodules, polymetallic sulphides and cobalt-rich ferromanganese crusts in the deep seabed. These leases cover a total of approximately 2 million km2 of the seabed,[i] creating the largest mining operation the planet has ever seen and dwarfing anything comparable on land. Kaneko et al., 1997; ISA, 1999; Thiel et al., 2001; Bluhm, 2001.